Recently, the Hog Roast Elland were hired by a new client for their event. The client hosted their party at the Elland WMC, a local venue. The event was to celebrate a 60th birthday party so it was important that everything ran smoothly. The food was to be served as a buffet to suit the casual atmosphere of the birthday party. The client selected the Hog Roast Elland team’s Menu One which was a traditional hog roast served with all of the classic sides. 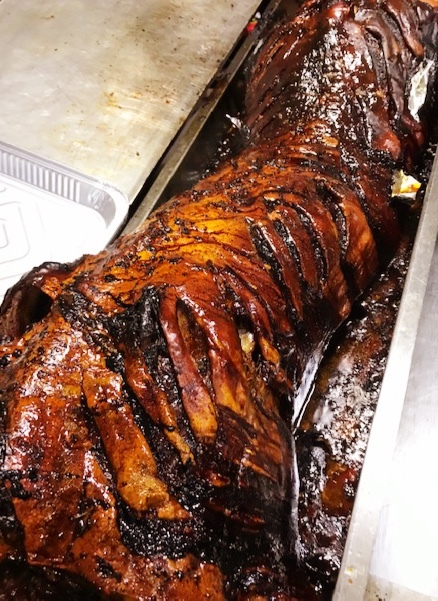 The menu featured a slow roasted hog which had been cooked to perfection in one of the Hog Roast Elland team’s professional Hog Master machines. The roasted hog was served with delicious apple sauce, homemade stuffing and crispy crackling made in the Hog Master machines. The meat was also served with fresh bread rolls and wraps as well as a selection of sauces. As an alternative to the meat, a delicious vegetarian option was served on the buffet table which consisted of grilled vegetable and halloumi skewers which were served with pitta breads and tzatziki sauce. All of the Hog Roast Elland team’s ingredients were all sourced locally and prepared and cooked on site to ensure that the food tasted fantastic. The buffet was served to 120 people and so it was important that the Hog Roast Elland team’s food remained consistent throughout the service. In addition, it was important that the food remained hot throughout the evening as it would take time to serve all of the large number of guests. The food was served between 8 pm and 9:30 pm so it was important that the Hog Roast Elland team topped up the buffet as the evening continued to ensure that there was more than enough food for everyone. The Hog Roast team’s Head Chefs, Jon and Andy, ran a very smooth service and helped to create a fantastic atmosphere. During the service, the head chefs were very casual and chatty and also presented themselves in a very friendly way. The guests really enjoyed the food and the birthday party was a fantastic success.